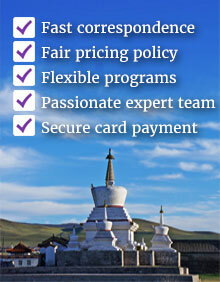 We definitely know that you need a help on packing to Mongolia. We’re recommending you following things on packing list. Internet access is available everywhere in Ulaanbaatar city, you can use wifi at almost all of restaurants, cafés, coffee shops, but not available in the countryside. Some of ger camps offer bad speed of internet with some extra charge. So, don’t need to bring your laptop, ipad or your smart phones are okay to bring. 3G and 4G by Mobicom and Unitel/telecommunication company/ both broadly accessible throughout the countryside. Mobile access: You can buy pre-paid SIM card for your mobile phone, smart phones including IPhone with small cost about ~ US$3 and can buy international phone call unit with cost of ~ US$3 – US$15 and can write sms to your family. Per sms is US$0.1. Electricity: 220 V, round pinned European style plugs are used, but every kind of plugs are available in Ulaanbaatar city. Most of the tourist ger camps have electricity for recharging batteries etc. Some of eco – ger camps use “Candle” for a light at your ger and electricity is only available in a restaurant. So, please being your own adapters and extra batteries for your camera. Mongolian currency “Tugrik or Togrog” MNT is used in the country. You can bring as much USD, GBP, Euro as you can in the country as there’s no limit. Those currencies can be changed at banks (work for 24 hours) into cash MNT. Travelers Checks are not recommended to bring as it is limited availability to change at banks. You can withdraw cash from your international VISA or Master Cards. Also in Ulaanbaatar there are many ATMs. You can convert your leftover MNT back into USD, GBP or Euros at the end of the trip. USD bank notes that you bring into the country must be printed in 2000 or later and should be not torn or wrinkled. Otherwise, won’t be accepted anywhere. Depending on how long you travel in Mongolia, ~ 1 – 5 times visit to nomadic family will be included in a trip in Mongolia. Nomadic families in the different places of Mongolia are slightly different from each other. For example, you can’t visit to camel breeder family in the Northern Mongolia and can’t find a yak breeder family in the Gobi desert. Nomadic people are very hospitable people and they serve without asking your permission what they have and their door is always open for anyone. The only thing is that it is suggested to bring a “gift” from you when you visit – it can be simple things like stationeries, books, toys to their kids, or souvenirs to housewife. Choose something they could use for everyday lives and of course a thing that they could remember you always. Because of Mongolians never forget to bring a gift when they come back from long journey or leave, to every single people of their family and relatives. Mongolia has very extreme weather, especially if you travelling in May and September. When it rains in May & Sep, it can turns to snow a day after it rained. So, please bring, summer, & autumn and light warmer fleece, hat, gloves, and scarf etc. We don’t have monsoon season, but from second week of July, rain can happen more often than other months and when it has rain more than a week, the weather can get down to ~ + 5’C a day. So, when you’re travelling in Jun, Jul and Aug, it would be great if you have one warm fleece or light outerwear, scarf, trouser. Except from these situations, you can bring summers clothes like you wear at home. Mongolia is not a tropical country even though it is hot during high summer but you do not need to worry about insects, poisonious snakes or mosquitoes and any other sicknesses. Just Pack up + Go! If there are more things to ask on packing, please seek a help from us.